I haven’t always had a good relationship with mushrooms. In the past, they didn’t agree with me, and now I suspect it was my body crying out for attention. I had the same problem with red wine — my body was trying to tell me that something in my system was causing me a lot of harm. Since I’ve been gluten free, I’ve been able to enjoy mushrooms *and* red wine without any problems. Reintroducing mushrooms to my cooking repertoire has been fun. For a while now, I’ve been in a rut when it comes to adding something meaty, but, you know, not meat, to dinners. I’ve mastered tofu, I adore tempeh when I can find a gluten-free version, but I’m just loving adding mushrooms to the mix (as is my husband, a huge mushroom fan; his patience and understanding during our mushroom-free years was amazing). There are lots of ways to enjoy mushrooms, and you probably (unlike me) enjoy them with lots of meals. I’ve added them to the standards, but have also been playing new ideas for mushrooms. I mean, why not get creative? This is why I’m not adding the ever-popular, vegetarian / vegan staple of portobella mushroom burgers to the list. Yeah, they’re fine for what they are, but if there’s one thing I’ve learned, it’s how to make incredible dishes for the non-meat eaters in my circle (ahem, including me) rather than feeding them the same old thing. Portobella Mongolian Stir Fry. Revelation number one came when I realized I could substitute tempeh for beef in this recipe. Revelation number two was “Hey, mushrooms!”. Seriously, the meaty, chewy texture of portobella mushrooms are perfect for this easy stir fry. This particular stir fry style has become one of my favorite weeknight solutions since I always have the basic ingredients on hand. 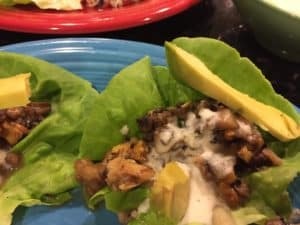 Mushroom Lettuce Cups. I have made delicious lettuce cups — the perfect summertime or party dish — with ground chicken, ground turkey, and, ahem, seasoned silken tofu. Flavorful mushrooms were the logical next step, and were extremely popular with my book club. I mixed minced water chestnuts into the dish to add a crunch texture. The best part of this recipe is its versatility: you can take the sauce you use in lots of creative directions. Mushroom Tacos. Oh yes, I can make a taco out of anything. Use gluten-free corn tortillas to add loads of flavor. Season the sliced mushrooms — your choice of style — with salt and pepper to keep it simple, then add a great salsa, some avocado, or even pickled vegetables. You will be addicted. Stuffed Portobella Mushroom Caps. The is the classic meatless main. Stuffing vegetables — from bell peppers to tomatoes to spaghetti squash — is always fun, and mushrooms are no exception. The trick here is to snap off (or trim off) any remaining stem before stuffing. I generally mince the stem into whatever I’m using as a filling to add extra flavor. Meatloaf and Meatballs. I *think* I stole this trick from America’s Test Kitchen. If I didn’t, it’s certainly a tip they would invent. Mushrooms are a great ingredient for meatloaf and meatballs. Not only do they add loads of flavor, but they also help keep the dishes moist, something very important as gluten-free bread crumbs can be expensive, and I never seem to have them on hand when I need them. I’ve found this trick works for both meat-based and legume-based meatloaves and meatballs (lentils and mushroom meatballs, anyone?). Mushroom Ragout. This was the first all-mushroom recipe I tried after discovering my mushroom issues were not related to mushrooms (seriously, what is it about celiac that causes so many aspects of our bodies to go haywire?). It’s a simple, all mushroom dish that can be served over pasta, rice, or eggs (see the next idea for another twist on this concept). This preparation gives a French / European flair to mushrooms, reminding all of us that fine French cooking is based on delicious rustic foods. Egg Foo Yung. 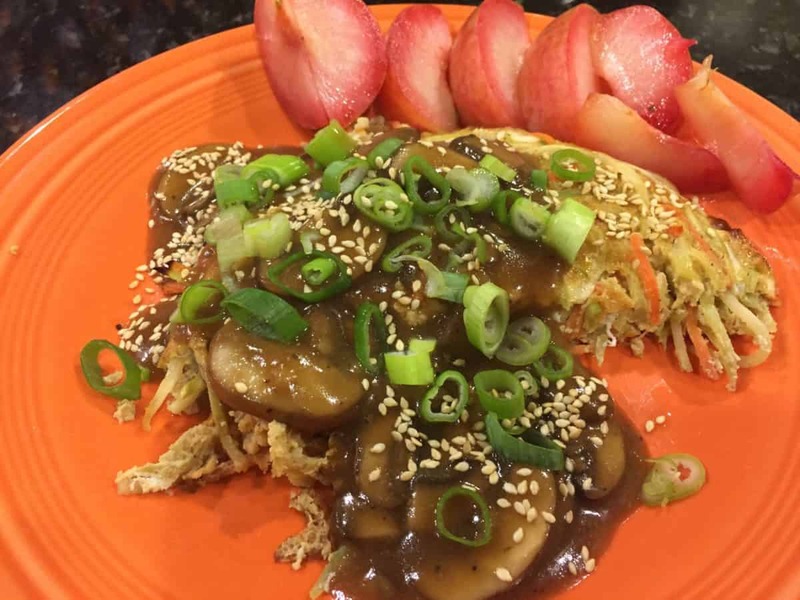 At its heart, Egg Foo Yung is a Chinese omelette, and that’s what makes it so much fun. While there are traditional preparations of this dish, a quick glance at the ingredients and preparation reveals there are lots of ways to customize this recipe to suit your tastebuds. It’s just a bonus that the leftovers are awesome, too! Mushroom Bacon. Yeah, someone went there. And others went there. And it’s a thing. It’s not going to replace real bacon in the hearts and souls of bacon eaters, but if you’re craving the flavor, mushroom bacon may get you through the worst of it. Mushroom Chips. Since I bought a dehydrator on Prime Day, I’ve been drying lots of veggies and fruits into chips. No, they’re not the delicious, oily, salty chips I adore, but I’ve been really happy with the flavor (hint: add a bit of spicy seasoning to apples before drying to complement the sweet fruit). You can bake your mushroom chips, as in this recipe, or use a dehydrator. They will be good! So what do you think of these ideas? What fun stuff do you do with mushrooms? Please share. This vegan dinner features diced mushrooms and walnuts topped with a light cashew cream. Super-fast, super-easy, totally gluten free. I’ve always stored my mushrooms in their grocery store packaging, and that has seemed to work just fine. It turns out others find that approach — store packaging, keep them sealed with plastic wrap or in a plastic bag, still in the container, if you don’t use them all. Generally, mushrooms last for a week if you follow this method. Use the same method for loose mushrooms, making sure there are holes or a gap in the plastic wrap to let them breathe. I’ve been watching a British series called A Cook Abroad on Netflix. While it’s your typical chef travel series, it’s also interesting. A recent episode set in the Jura mountains region of France reminded me of the Mushroom Ragout recipe I note above. However, the mushrooms were served over a bowl of soup, and I just melted at the thought of serving that dish. Maybe it’s because my cooking style will never be conceived of as elegant, but I love simple, rustic dishes. Delicious and unpretentious. Mostly pretty enough for Instagram, but with awesome flavors instead of just awesome looks. Soup with a mushroom topping hits all those notes. The recipe I link to below is close. While I’m fairly certain socca isn’t from that particular region of France, it certainly fits with the theme. The earthy flavor of chickpea flour complements the soup, and offers something for spreading cheese or butter to round out the meal. 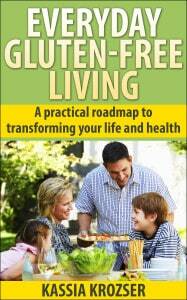 Previous Previous post: Leafy Greens: Gluten-Free Superfood!